What kind of fantasy and science fiction work is emerging from new markets in Asia? Who are the new wave of authors who are rewriting the future of Indian subcontinent? How are authors reimagining storytelling through speculative fiction? How do Asians perceive speculative fiction as a genre? What are the fan clubs in Asia? Shweta Taneja is a feminist speculative fiction author from India. With seven published novels, she is a leading voice in feminist science fiction and fantasy. In this lecture, she will retell her experiences of being a female and writing feminist stories for an audience which is mostly male. She will also retell experiences of her past, what fantasy means to her and her experiences of being a feminist fantasy author in a conservative, patriarchal country. 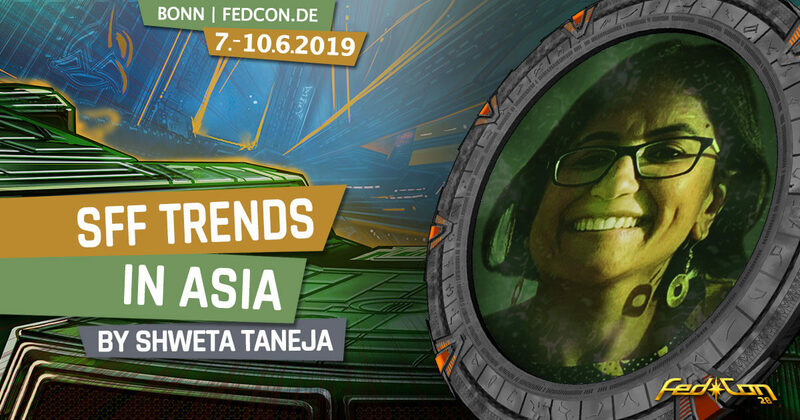 The talk SFF trends in Asia at FedCon will also mention emerging trends, publishing industry and readership in speculative fiction in Asia, focusing on the Indian subcontinent. Shweta Taneja is a bestselling Indian fantasy and science fiction author. Her work uses humour to play with gender, class and caste perceptions in Asia. She’s a "Charles Wallace India Fellow" (2016) and was shortlisted for "Best Writer Award" in "ComicCon India" for her graphic novel The Skull Rosary (2013). Her bestselling graphic novel Krishna Defender of Dharma (Campfire, 2012) in a Must-Read for government schools in India. Her short story 'The Daughter That Bleeds' won the "Editor's Choice Award" in India and is translated to French and Romanian. She has given talks about Asian fantasy in "Eurocon", "University of Chichester" and "Cartoon Museum", London.